Corporal Eric R. Lueken was born in Jasper, Indiana, on 25 February 1983. He graduated from North East Dubois High School in 2003, and joined the United States Marine Corps on 15 October 2003, at Marine Corps Recruit Depot Parris Island. Corporal Lueken continued his Military Occupational Specialty training at the Field Radio Operator Course at Twentynine Palms, California. 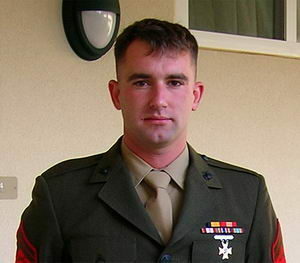 After graduating from Field Radio Operator Course, Corporal Lueken was assigned as an 0621 Field Radio Operator to 3d Battalion, 3d Marines, on 19 May 2004. He completed a deployment to Afghanistan in support of Operation ENDURING FREEDOM in June 2005, and deployed to Iraq in support of Operation IRAQI FREEDOM in March 2006. He was killed in action on 22 April 2006. His personal awards include the Purple Heart and the Combat Action Ribbon. He is survived by his mother, Melinda Lueken, and his father, Glen Lueken. KANEOHE, Hawaii – A hunter’s arrow must always find its target. One hunter certainly made his mark on a new generation of 3rd Battalion, 3rd Regiment Marines, as they honored his memory. Lt. Col. Jeffrey Holt, commanding officer, 3/3, gathered his Marines to the front of the base chapel Jan. 13, where a large black case sat across several chapel chairs. On the case is inscribed the name of radio operator Cpl. Eric Lueken. The 23-year-old from Dubois, Ind., was killed in action April 22, 2006 by an improvised explosive device in Al Anbar province, Iraq. He was posthumously awarded the Purple Heart and the Navy Achievement Medal. Nestled in the case’s foam padding is a bow made to honor a Marine who “could always make a bad situation good,” according to his friend and former Marine, Dennis Sullivan. “He could make everybody laugh,” said Sullivan, of Williamsport, Pa.
Lueken’s father Jake; Troy Euclide, Marine Corps Family Team Building director; and Mike Lueken, a family friend, presented the bow in Eric Lueken’s honor, to 3/3. “Anything we do is a small token compared to what [the military is] doing for all of us,” said Mike Lueken, the operations manager of Strother Archery. Brian Park, president of Strother Archery, shares the same sentiment. The black and gray SR-71 bow presentation came together through contributions from several organizations and individuals. Holt, who used to bow hunt, offered to teach interested Marines how to use the bow and arrows, which will make their new home at 3/3’s command post. Euclide, a former first sergeant, was the casualty assistance calls officer assigned to assist the Lueken family, and has since remained close friends with them. An avid hunter since childhood, Eric Lueken learned how to use his first bow and arrow from his father, and frequently hunted with him. Unlike other children, Jake Lueken said his son was able to keep very quiet, a necessary skill in hunting. He would later take up fishing and basketball. Ken Bohnert, a friend of Jake Lueken, called Eric Lueken an “all-American boy” and a “true Marine.” Before one of Eric Lueken’s previous deployments, Bohnert, a former Marine, gave him his KA-BAR fighting knife. “Keep your head in the game and give this back to me,” Bohnert told Lueken. When Eric Lueken returned from that deployment, Bohnert told him to continue to hold on to it. After Eric Lueken’s death, the knife was recovered and returned to Bohnert, who keeps it as a memento on his mantel. Others still reminisce with each other about Eric Lueken. Though they have since left the Corps, Sullivan and Mike Fosque never forgot the friendship they made with their fellow Marine. Sullivan, who was a private first class when he met Eric Lueken, always “gets a chuckle” recalling a hair cutting incident in Afghanistan. Even though Eric Lueken was particular about his hair, Sullivan jokingly shaved him completely bald. “He in turn got to shave my head,” Sullivan said. Fosque, a former corporal, described him as a “really nice kid” who could make anything positive. “Training was always fun with him,” Fosque said. Fosque said the three of them would frequently spend time together during off hours, whether it was going to the beach or having cookouts at the barracks. MARINE CORPS BASE HAWAII — Sometimes honoring a person’s sacrifice can be unique. Former Hawaii-based Marine Cpl. Eric Lueken, 23, paid the ultimate price and has since been honored in multiple ways, including his name appearing on buildings, banners and monuments. Now, his name will be rocketed around a racetrack. Lueken was a radio operator with 3rd Battalion, 3rd Marine Regiment and native of Dubois, Ind., when he was killed in action April 22, 2006, by an improvised explosive device in Al Anbar province, Iraq. John Marks, Lueken’s cousin, participated in wounded warriors specific events and the Boston Marathon in Lueken’s memory. Now, Lueken’s name will appear on NASCAR racecar driver Kurt Busch’s number 41 Stewart-Haas Chevrolet this September after Marks decided to nominate him through the Race Dedication Program. Through the Race Dedication Program, a collaboration between Busch and the Armed Forces Foundation, the 24-time race victor races in memory or in honor of a service member throughout the NASCAR season. The goals of the program are to raise awareness about post-traumatic stress disorder, traumatic brain injury, military suicides and honor service members and veterans, particularly combat wounded or fallen warriors. The program also focuses on connecting the NASCAR community to the armed forces and veterans. 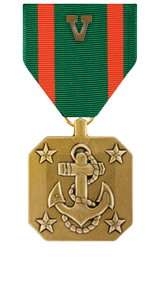 Lueken was posthumously awarded the Purple Heart and the Navy and Marine Corps Achievement Medal. His other awards include two Combat Action Ribbons as well as the Iraq and Afghanistan Campaign Medals. He enlisted in the Marine Corps October 2003, two years after graduating from high school. Lueken’s parents, Jake and Melinda, explained how they felt honored knowing their son’s memory would live on in such a way. Jake Lueken and Marks plan on going to the NASCAR Chicagoland Speedway in Joliet, Ill., Sept. 15 to see Eric’s name on Busch’s race car. The nominee for next commandant of the Marine Corps wears a memorial bracelet in honor of a Marine he never met. Lt. Gen. Robert Neller wears a black cuff engraved with the name of Cpl. Eric Lueken, who was killed in Iraq’s Anbar province in 2006 at the age of 23. The bracelet is a reminder of the responsibility that comes with the stars on his shoulder, Neller said. At the time of Lueken’s death, Neller was the deputy commanding general for operations for I Marine Expeditionary Force (Forward) in Iraq. A new technological adaptation was then under hot debate: the addition of rollers and arms to the front of tactical vehicles to better protect against improvised explosive devices. And Neller was in the middle of the discussion. “I was told by a bunch of well-intentioned Marines that if we develop rollers we would create a hazard for the vehicle, we’d frag the gunners, and it was a bad idea,” Neller told Marine Corps Times following his confirmation hearing before the Senate Armed Services Committee on Thursday. So when he got a report of the death of Lueken, a member of 3rd Battalion, 3rd Marines, it stopped him in his tracks. At the next meeting to discuss putting mine rollers on vehicles, Neller said he heard the same objections but wasn’t swayed. Before summer of 2006, Neller said no vehicles were pushing mine rollers anywhere in Iraq. By 2008, they had become standard gear. The technology was used throughout the wars in Iraq and Afghanistan and remains a military asset. The story also speaks to Neller’s philosophy as a commander and may offer a clue to his future as commandant of the Marine Corps by demonstrating the value he places on decisive leadership and making big changes without unnecessary hesitation. Neller and other Marine leaders face tightening post-war budgets, acquisition challenges, and tough decisions on integrating women into combat roles. The bracelet, Neller said, was a token to keep him from doubting his own convictions or hiding behind inaction. Neller is expected to be confirmed before the Senate takes its summer recess in early August. Heroic achievement in the superior performance of his duties while serving as radio operator, 1st Mobile Assault Platoon, Weapons Company, 3d Battalion, 3d Marines, Regimental Combat Team-7, I Marine Expeditionary Force Forward, from March to April 2006, in support of Operation IRAQI FREEDOM. During this period, Corporal Lueken expertly provided tactical communications support that facilitated counter-insurgency operations. In addition to his demanding duties that encompassed technical troubleshooting and accountability for communications equipment not normally found in an infantry unit, Corporal Lueken assumed the position as vehicle driver on the treacherous roads of Iraq. On 3 April 2006, he quickly and efficiently responded to an improvised explosive device attack on his patrol by expertly reporting the situation to higher and assisting in the expeditious evacuation of casualties. He performed his duties in an exemplary and highly professional manner, setting the standard for other marines to emulate. Corporal Lueken’s initiative, perseverance, and total dedication to duty reflected credit upon him and were in keeping with the highest traditions of the Marine Corps and the United States Naval Service.